Worms (Nematodes) can have a significant impact on both the health of lambs and the profitability of sheep farm enterprises. Controlling these parasites has always been challenging due to the severity and at times unpredictability of the diseases and in recent years the issue of anthelminthic resistance has reared its head. To have a successful worming programme is like managing a football team; you need to understand the opposition and know what talent you have on your side. The “opposition” are the worms and the “talent” are the doses at your disposal and pasture management. The stomach and intestinal worms of sheep all have a direct life cycle, consisting of parasitic stages within the sheep and a non-parasitic stages on the pasture. Eggs are passed in the faeces onto the pasture and hatch. The larvae develop and leave the dung pat and migrate onto the sward in the right conditions. Here the sheep will graze them along with the grass and once in the stomach or intestines they become adults, mate and produce more eggs, and the cycle continues. This affects young lambs, generally 6 to 12 weeks of age in the spring. The infective larvae appear on the pasture suddenly when the over wintered eggs hatch after a period of cold followed by warm temperatures over 10oC. The eggs will have been shed by last year’s lamb crop. The immature worms can cause significant disease and death before the adult worms start to produce eggs that can be detected in the dung. Nematodirus causes a dark watery scour but sudden deaths may also occur. It is difficult to distinguish it from coccidiosis, which can also occur in the early spring in this age of lamb. The former affected the abomasum and the latter the small intestine. They reduce appetite, cause scour and weight loss. The larvae and adults will cause disease and unlike Nematodirus the infectious larvae on the pasture build up more slowly after eggs have been shed by both ewes and lambs earlier in the spring and the autumn. As a result taking faecal eggs counts from lambs can be used as part of a prediction tool to plan when lambs should be dosed. There are five different classes of worm dose that act on the worm parasites in different ways. All these wormers kill the adults and some of the larvae that are present at the time the dose is administered. The Cydectin range of doses, which are Class 3, Clear Drenches, are unique in that they have a persistent effect against both Teladorsagia and Haemonchus. Here the dose not only kills the adults and larvae that are present at the time of dosing but will continue to kill larvae as they are ingested for up to 5 weeks/35 days. This has the advantage of less handling and less dosing. Worm treatments for sheep are generally administered by mouth using a dosing gun and the volume to be used is calculated with reference to the weight of the lamb being dosed. In other parts of the world anthelmintic resistance is well recognised. Limited research in Ireland has shown that farms do have populations of nematodes that are resistant to some of the commonly used anthelmintics. Extensive work has been done in the UK to develop new approaches to dosing sheep to ensure that worming sheep is done in a sustainable way. These guide lines are called the SCOPS principle – Sustainable Control of Parasites in Sheep. http://www.scops.org.uk/index.php Many of the practises that were carried out in the past in fact increased the likelihood of anthelmintic resistance developing. There is not a single plan that will work for all farms. Each farmer will have to adapt a plan depending on his production system, climatic conditions, grazing practices and doses that are available. 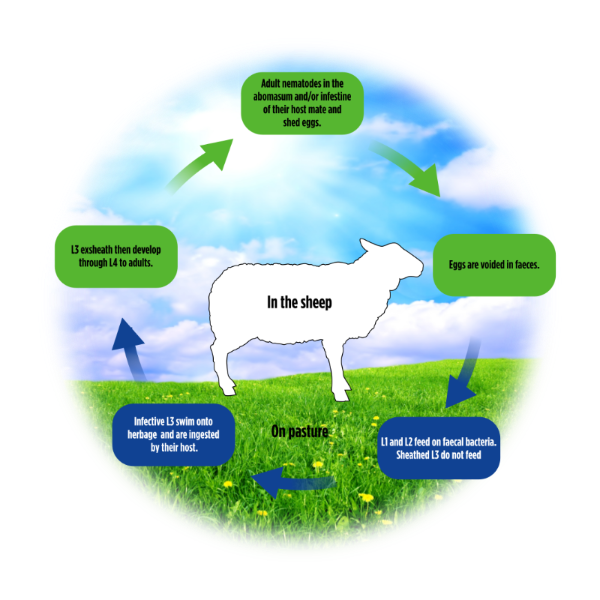 Most farms in Ireland will generally need to dose lambs in April/May for Nematodirus and then in the summer months for the summer worms, Tealdorsagia and Trichonstrongylus. Faecal egg counts can be used to help predict when and how often lambs need to be dosed in the summer but not for Nematodirus.